In 2017, "Astérix 37: Astérix et la Transitalique", called "Astérix and the Chariot Race" in English, was the bestselling book title in France. Written by Jean-Yves Ferri and illustrated by Didier Conrad, it was the 37th book in the famous Asterix series. The adventures of a village of Gauls remain popular in France, a country where 24 percent of the inhabitants considered themselves as fervent readers. “Astérix et la Transitalique“ was published in both print and digital formats and sold close to 1.6 million copies in 2017 in France. This success confirms comics are among the most popular books genres in France. But this ranking also shows the popularity of some authors in the country. “Un appartement à Paris” and “la Fille de Brooklyn", two of the ten bestselling books in France that year, have been written by Guillaume Musso. The Italian saga of Elena Ferrante “l’amie prodigieuse” was also one of the biggest hits in French bookstores that year. Reading appears to be one of the favorite hobbies of the French. In a survey from 2017, 40 percent of French respondents declared they read 5 to 19 print books in a year. 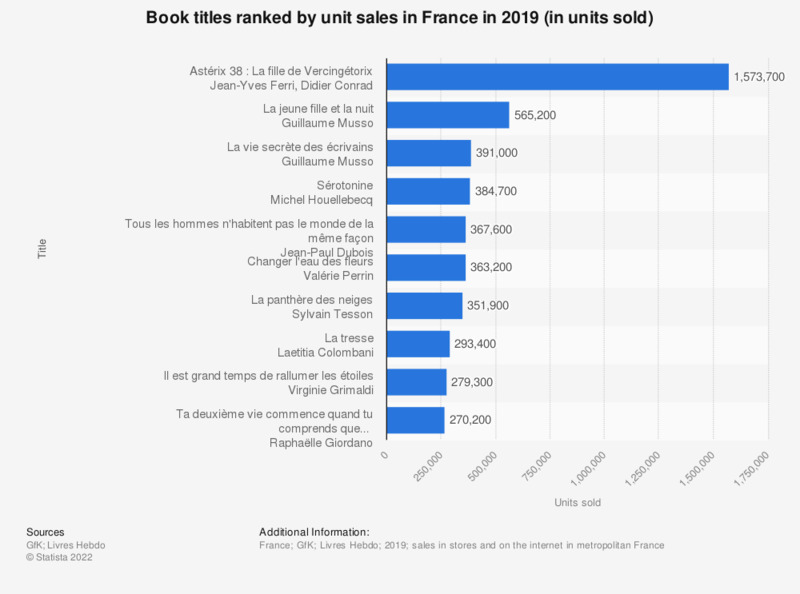 The production volume of books keeps increasing in France and the number of book copies sold in France is by far one of the highest in Europe. In 2016, more than 434 million copies were sold in France compared to 195 million in the United Kingdom. Figures are estimations based on the sales of a representative panel of sales point. United States: What do you think is a better book: To Kill a Mockingbird or Fifty Shades of Grey?